Moscow’s Russian restaurants can be divided into four groups: haute Russian cuisine, signature cuisine, traditional Russian cuisine and fast food. In haute cuisine restaurants, you will enjoy both skillfully cooked Russian dishes and the outstanding Russian aristocratic interiors. 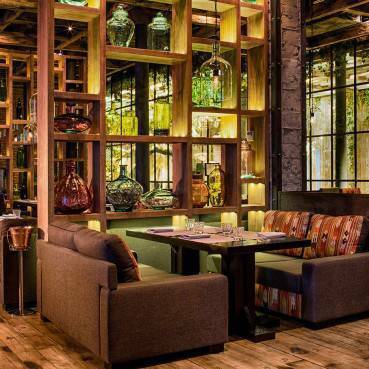 Numerous traditional restaurants are located in different locations around Moscow and feature a wide variety of interior designs ranging from Ancient Russian to Neo-Gothic styles. Petrovich Club and Restaurant is a home cuisine restaurant that takes you to the atmosphere of Soviet times and holds 80s disco shows. 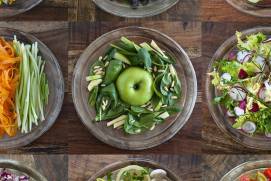 Signature restaurants serve up creatively cooked dishes made with seasonal farm produce, and chefs can even share a personal recipe with you. Many restaurants have menus in English and other languages. Russian blinisa Russian pancake traditionally made from wheat or buckwheat flour, caviar, soups and pies are well-known all over the world. Whilst these dishes are among Russia’s gastronomical highlights, this list is far from exhaustive. 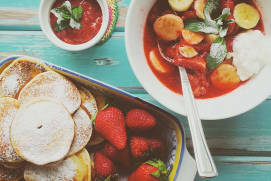 Russian cuisine is varied and rich in flavour. 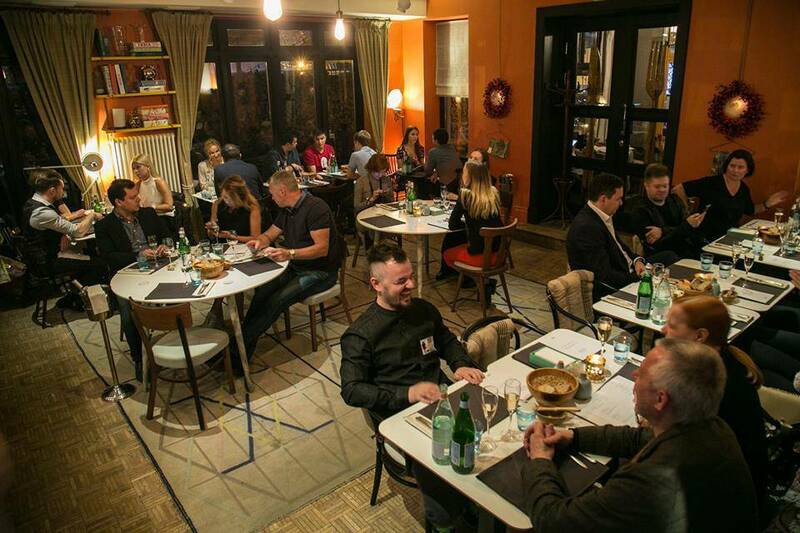 Restaurants are of excellent quality in Moscow; it is no coincidence that three of Moscow’s restaurants were ranked among the world’s top restaurants in 2016 (The World’s 50 Best Restaurants). These are: White Rabbit, Twins and Chestnaya KukhnyaRussian: Честная кухня (Honest Cuisine). Interestingly, all of them specialize in Russian cuisine. sbitenbeverage made from honey and herbs, kisela starch- or grain-based sweet beverage, as well as fermented milk drinks, such as kefir, ryazhenka and prostokvasha. 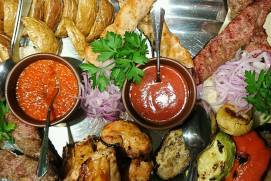 Fish and meat dishes (except for horse meat) are also widespread in Russian cuisine. 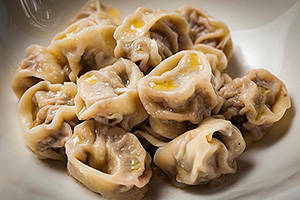 Meat is usually finely minced (such as pelmenidumplings consisting of a filling wrapped in thin, unleavened dough). Caviar often comes up when talking about Russian cuisine, but it is, in fact, a delicacy; in Russia, it is not consumed daily, but rather on special occasions. Black caviar from sturgeon is the most expensive variety of caviar, and very few can afford it. Vodka, an alcoholic drink usually associated with Russia, did indeed originate here. It was, however, never the main drink of choice in Russia. Instead, peasants preferred low alcohol drinks with a maximum alcohol content of 3% to 5%, such as mead, home brew and beer. The term vodka initially referred to a medicinal herbal tea. Today, many restaurants in Moscow specialize in Russian cuisine, falling into several categories as listed below. In these restaurants, famous chefs experiment with traditional Russian dishes or, on the contrary, cook classic Russian recipes to perfection. The average bill exceeds 2,500 RUB. The interiors and the atmosphere prevailing in these restaurants complement the food, and are an attraction in and of themselves. 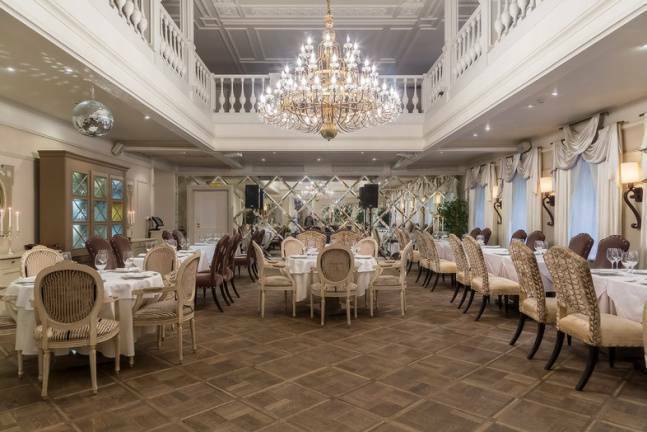 The best-known Russian haute cuisine restaurant in Moscow is, arguably, Café PushkinRussian: Кафе Пушкинъ, located in an old mansion at 26A, Tverskoy BoulevardRussian: Tverskoy bulvar or Тверской бульвар, in downtown Moscow. 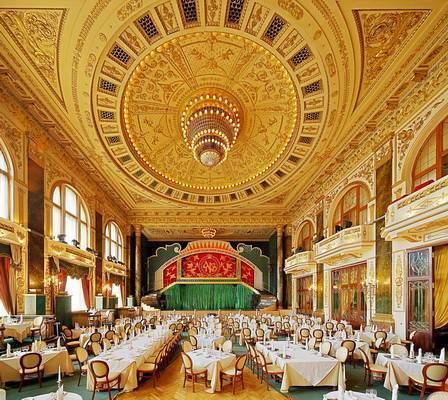 The restaurant’s interior recreates the atmosphere of an old aristocratic building, and its menu offers pelmeni, rasstegaysopen pies, traditional soups and Russian saladcalled in Russia olivie or оливье, reviving the culinary traditions of imperial Russia. When serving some of the dishes and beverages, waiters recite poems by Alexander Pushkin. 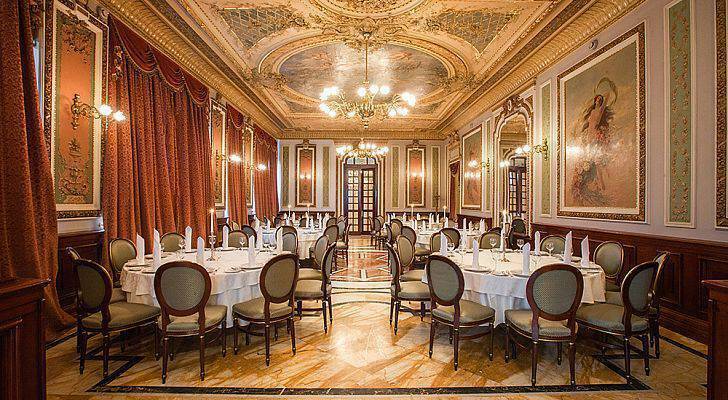 With every new season come “gastronomic premieres”, during which the chef presents new dishes. The menu is available in English, French and Chinese. A staff member keeps an eye on children if they wish to play in the playground area. 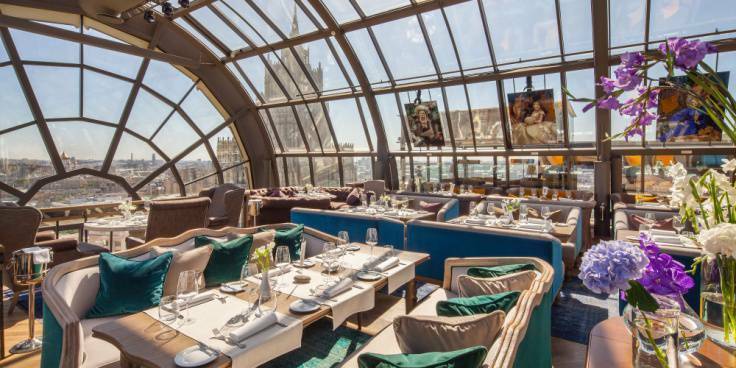 This restaurant is one of the priciest in Moscow, but you can certainly have breakfast here at a relatively reasonable price. Café Pushkin also has a sister restaurant in Paris. 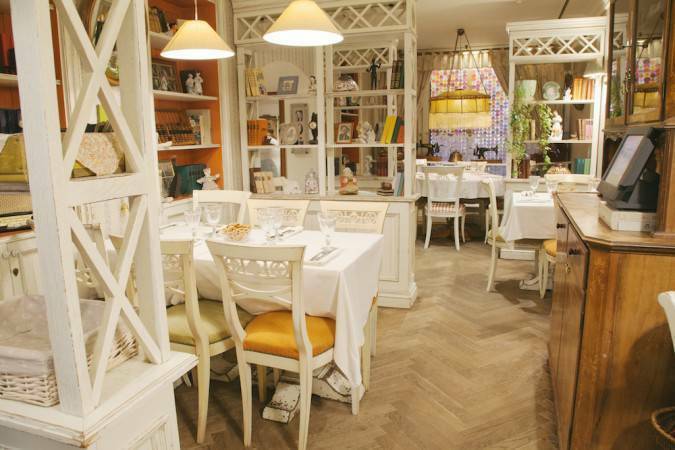 White Rabbit (3, Smolenskaya SquareRussian: Smolenskaya ploschad or Смоленская площадь) is the exact opposite of Café Pushkin in terms of interior design. It is situated on the 16th floor, right under the glass dome of the Smolensky PassazhRussian: Смоленский пассаж Complex across from one of the seven Stalinist skyscrapersMuscovites call them Vysotki or Stalinskie Vysotki, the Ministry of Foreign AffairsRussian: Ministerstvo inostrannykh del or Министерство иностранных дел main building. 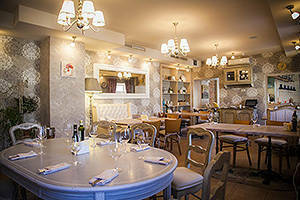 The restaurant is full of light and has small, soft sofas styled to the decor of various historical periods. In recent years, White Rabbit has been listed in The World’s 50 Best Restaurants. The chef, Vladimir Mukhin, has an entirely different spin of traditional Russian dishes (try borshtcha sour soup popular in several Eastern European cuisines with fried crucians, baked bean and turnip chips or fir-needle icecream) and opens every new season with a tasting menu, with new combinations of delicacies for you to try. Balchug Kempinsky MoskvaRussian: Балчуг Кемпински Москва (located in the same-name hotel), Caffe Russe (in Ritz CarltonRussian: Ритц-Карлтон) and VerandaRussian: Веранда (in Radisson Royal UkrainaRussian: Рэдиссон Ройял Украина). 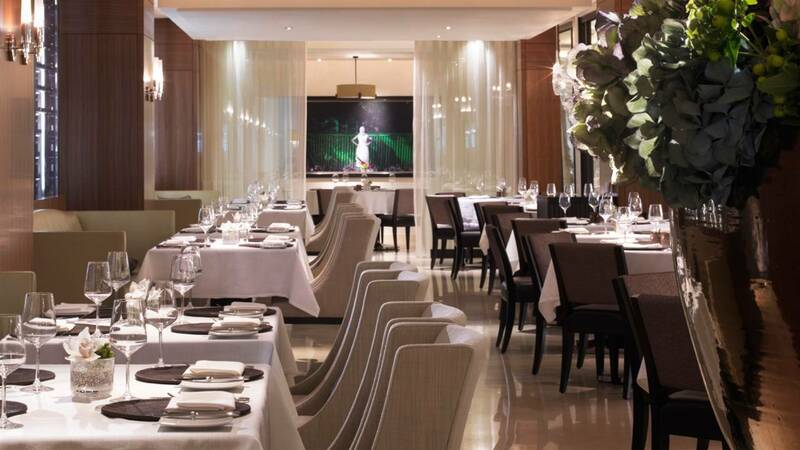 SAVVA, a restaurant newly opened in the hotel MetropolRussian: Метрополь, has become widely popular among Muscovites. 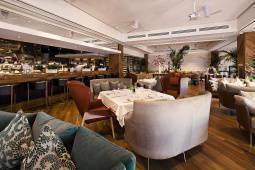 You can also sample Russian dishes at Bystro, a restaurant located on the premises of the Four Seasons hotel, while enjoying the views of the Kremlin, or at Dr. ZhivagoRussian: Dr. Живаго (in Hotel NationalRussian: Националь). 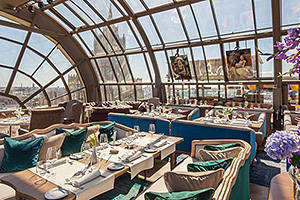 The hotel SavoyRussian: Савой has an eponymous restaurant which is worth a visit. restaurant, managed by Arkady Novikov, Bolshoi, is worth mentioning. As its name suggests, it is located a short distance from the Bolshoi TheatreRussian: Bolshoy teatr or Большой театр. Russian-style tea parties take place here daily from 3:00 am to 7:00 pm. Here, you can try affordable and delicious Russian pies and other bakery products in a setting decorated with original works by modern European painters and sculptors. 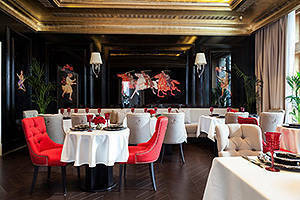 When speaking of upmarket restaurants, Anatoly Komm for Raff House is definitely worth a mention. 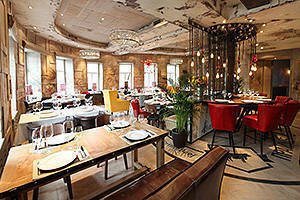 Ultramodern Russian dishes feature on the menu, but there is a variety of other dishes on offer as well. Chef Anatoly Komm has been recognised in Russia and beyond. 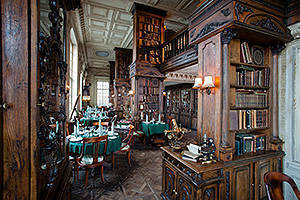 Traditional restaurants in the middle tier are innumerable in Moscow. Despite their different locations and interiors, these restaurants keep to the traditional set of Russian dishes. 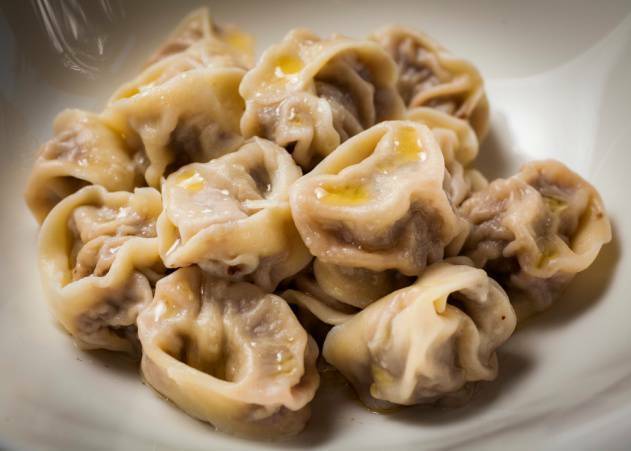 The available dishes include delicious soups, Pozharsky and Kiev chopsa breaded ground chicken or veal patty that is typical for Russian cuisine, pelmeni, dumplings, rasstegays, blinis and a wide variety of vodkas and liqueurs. 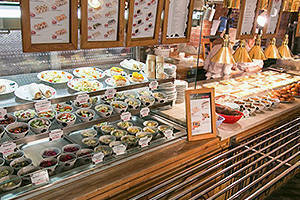 Some restaurants offer dishes which recall modest Soviet food, for instance, sausages with peas. The average bill would be somewhere around 1,500-2,000 RUB. 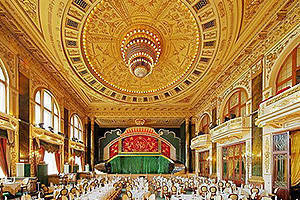 Other restaurants feature luxurious interiors reminiscent of the 19th century. 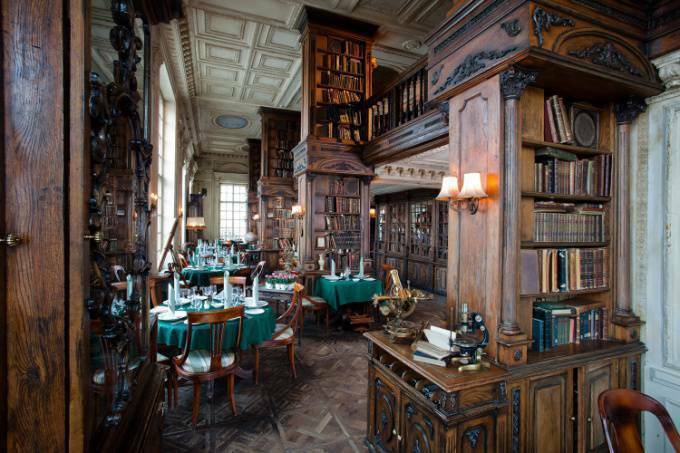 Some even have authentic hundred-year-old interiors, like the Central House of Writers Club-RestaurantRussian: Restoran Tsentralnogo doma literatorov or Ресторан Центрального дома литераторов (50, Povarskaya StreetRussian: ulitsa Povarskaya or улица Поварская) or Moscow’s oldest restaurant, YarRussian: Яръ, with its high ceilings, stucco moldings, gold leaf and incredible chandeliers (Block 2, 32, Leningradsky AvenueRussian: Leningradskiy prospekt or Ленинградский проспект). If you want to get a feel of 16th– or 17th-century Russia, have a peek at Staraya BashnyaRussian: Staraya bashnya or Старая башня and GodunovRussian: Годунов. Located at the same address (Block 1, 5, Teatralnaya SquareRussian: Teatralnaya ploschad or Театральная площадь), both restaurants are a stone’s throw from the Red Square. 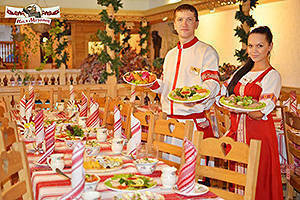 Their interiors are in the ancient Russian style and waiters are dressed in traditional Russian costumes. These places are highly popular among tourists. Some restaurants are built to resemble traditional Russian rural houses. They feature crudely built wooden furniture, household items and hand-embroidered towels. Some examples of this type of restaurant include Ilya MurometsRussian: Илья Муромец, a network of three restaurants (23, Leningradsky Avenue; 37, Leninsky AvenueRussian: Leninskiy prospekt or Ленинский проспект and 2, Preobrazhenskaya StreetRussian: Preobrazhenskaya ulitsa or Преображенская улица), and Korchma Taras BulbaRussian: Корчма Тарас Бульба, a network of eighteen cafés, the central one being located a few steps from the Kremlin (Block 1, 8, Mokhovaya StreetRussian: Mokhovaya ulitsa or Моховая улица). ShinokRussian: Шинок, belonging to the owner of Café Pushkin A. Dellos (2B, 1905 Goda StreetRussian: ulitsa 1905 goda or улица 1905 года), and Tsarskaya OkhotaRussian: Царская охота, owned by A. Novikov and located in the upscale village of ZhukovkaRussian: Жуковка along Rublyovo-Uspenskoye HighwayRussian: Rublyovo-Uspenskoe shosse or Рублёво-Успенское шоссе). 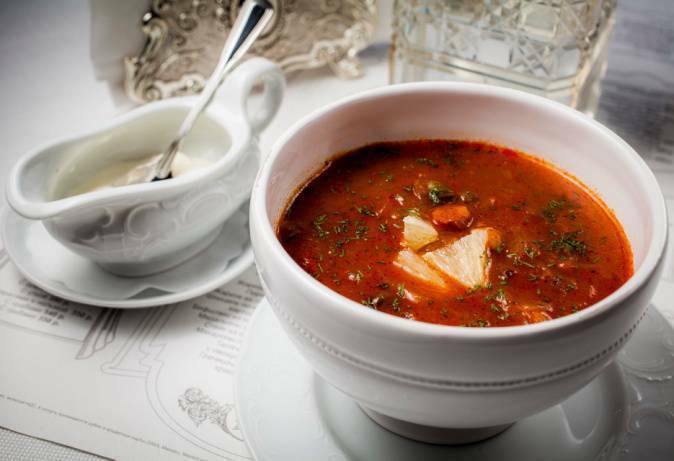 These are higher-profile village-style restaurants specializing in Russian and South Russian cuisines. 24, Myasnitskaya StreetRussian: ulitsa Myasnitskaya or улица Мясницкая) is one of the most vibrant Moscow restaurants reminiscent of the Soviet past. Its main symbol is Petrovich, a grotesque newspaper character popular in the 1990s and the collective image of a Soviet citizen from the 1970s. The ostensibly simple and unpretentious interior contains authentic objects from the Soviet past and offers home-made specialties. Dance parties to popular retro music from the 1980s take place here on Saturday nights. 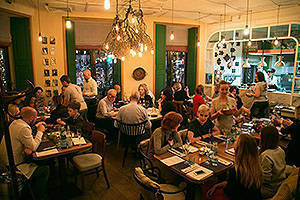 The restaurant is popular mostly among those aged 35 and above. Located a short distance from Patriarshiye PondsRussian: Patriarshie prudy or Патриаршие пруды (10, Spiridonyevsky LaneRussian: Spiridonevskiy pereulok or Спиридоньевский переулок), Mary VannaRussian: Мари Vanna is another restaurant reminiscent of pre-revolutionary Russia. With its lampshades, white tablecloths, sewing machine, flowers on the windowsill, wallpaper and old photographs hanging on the wall, it resembles a cozy urban living room. The restaurant does not boast any breathtaking views of the Kremlin; instead a relaxed, homely atmosphere prevails here, and the homemade food is great. Mary Vanna restaurants are not exclusive to Moscow; they have franchises in St. Petersburg, London, New York, Los Angeles and Washington, D.C. 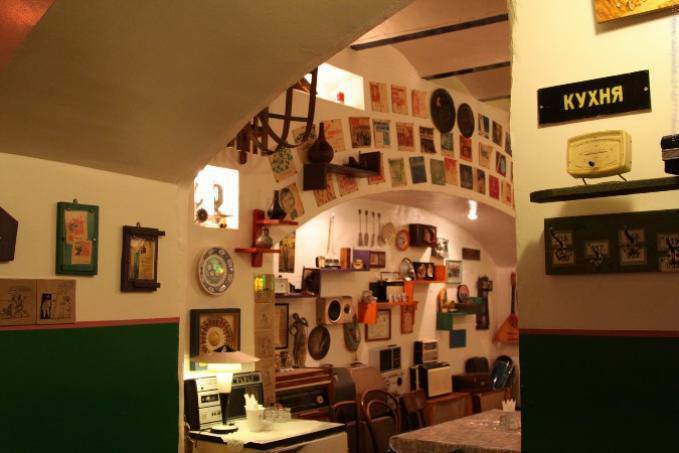 Restaurants specializing in Orthodox Christian cuisine are also worth a look. These places might be of particular interest to vegetarians, as the art of transforming common vegetables and grains into delicacies is well-developed in Russian cuisine. You can also try traditional monastery food at DanilovskyRussian: Даниловский (5, Bolshoy Starodanilovsky LaneRussian: Bolshoy Starodanilovskiy pereulok or Большой Староданиловский переулок), a restaurant located near the Danilov MonasteryRussian: Danilov monastyr or Данилов монастырь. Even if you are in a beautiful historic area or a tidy park, walking around the huge city takes up a lot of energy. For you to have a rest in the best way, on the pages of our website there is a lot of information about the best restaurants in Moscow, best bars and best pubs in Moscow. These restaurants are mostly run by Moscow’s renowned chefs. For example, Twins (13, Malaya Bronnaya StreetRussian: Malaya Bronnaya ulitsa or Малая Бронная улица) is owned by the twin brothers Berezutsky, hence its name. Highlights of this rather pricy restaurant are include the tableware and originality of the recipes. Take, for instance, dynamite-shaped desserts and venison tartare smoked over birch bark. Another project launched by the White Rabbit Group, Selfie (31, Novinsky BoulevardRussian: Novinskiy bulvar or Новинский бульвар) is centered around its young and talented chef Anatoly Kazakov. 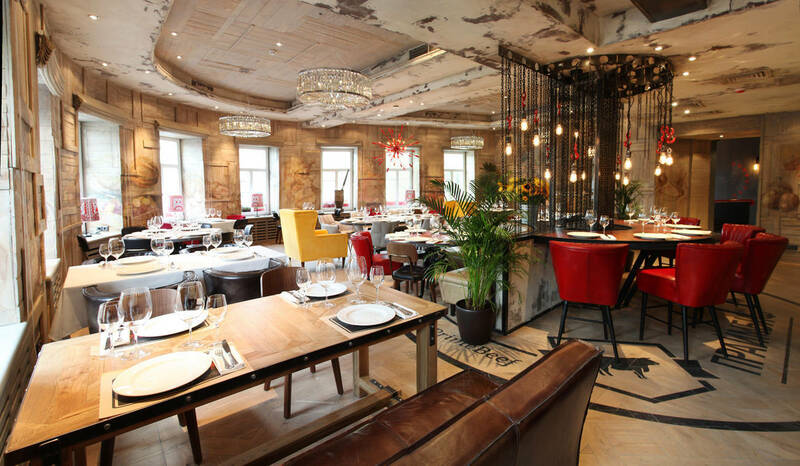 The kitchen is located in the middle of the hall, transforming the restaurant into a sort of gastronomic theatre overlooking the old Moscow and the Garden RingRussian: Sadovoe koltso or Садовое кольцо. Respect for traditional cuisine fused with modern cooking and use of seasonal products of Russian origin underpin the Selfie concept. Chestnaya KukhnyaRussian: Честная кухня (10, Sadovaya-Chernogryazskaya StreetRussian: Sadovaya-Chernogryazskaya ulitsa or Садовая-Черногрязская улица) is yet another restaurant run by a chef. 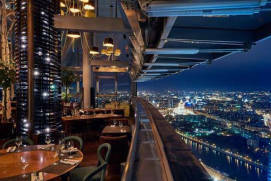 Sergey Yeroshenko defines it as a gastronomic restaurant specializing in modern Russian cuisine. 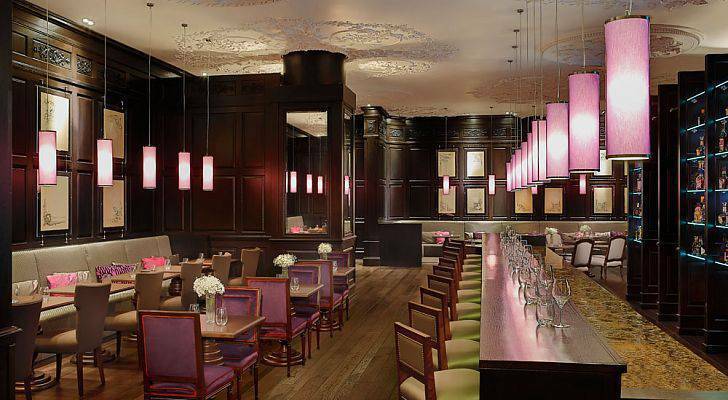 The chef handles seasonal farm produce, and fowl, deer and duck dishes are also on the menu. Both Twins and Chestnaya Kukhnya figure among the world’s top 100 restaurants (according to The World’s Best Restaurants in 2016). The owner of Chestnaya Kukhnya also runs a market and Fedya, DichRussian: Федя, дичь Café, both located at the Danilovsky marketRussian: Danilovskiy rynok or Даниловский рынок (74, Mytnaya StreetRussian: Mytnaya ulitsa or Мытная улица). Here, you can buy fresh products and then have them cooked on the spot. Meat, poultry and fish dish options are available and you can get free recipes from the chef. The butcher shop and restaurant VoronezhRussian: Воронеж (4, Prechistenka StreetRussian: ulitsa Prechistenka or улица Пречистенка) operates on a similar idea. 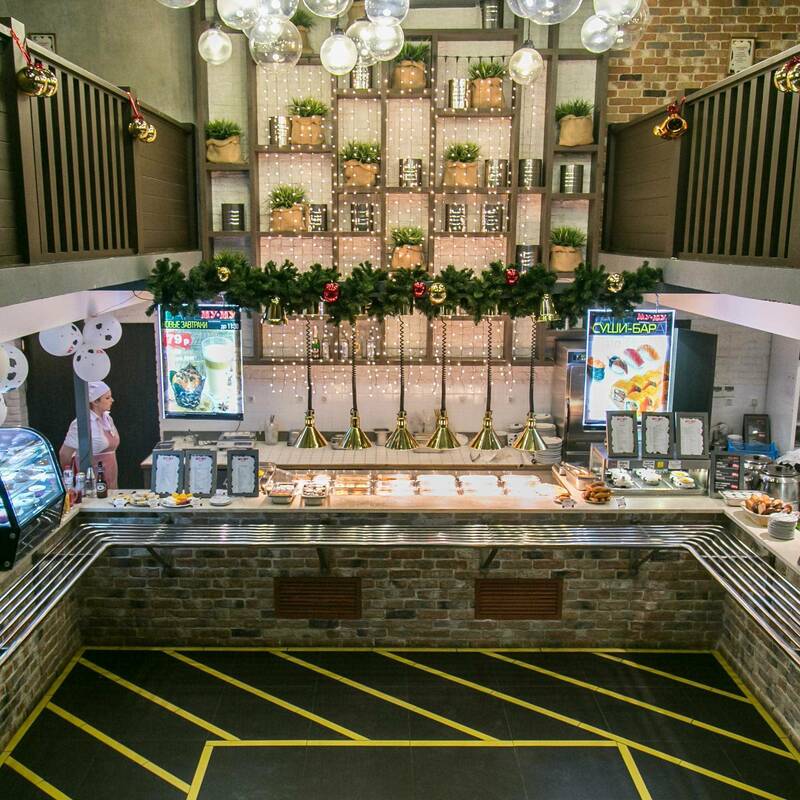 On the first floor of the four-storey mansion are the butcher shop and a snack bar, on the second floor is Voronezh, a restaurant offering specialties from Russian regions, and the restaurant Myasnoy KlubRussian: Мясной клуб is located on the third floor. EkspeditsiyaRussian: Экспедиция, an unusual restaurant specializing in Northern Russian cuisine, is situated in an historic area known as Kitay-gorodRussian: Китай-город (6, Pevchesky LaneRussian: Pevcheskiy pereulok or Певческий переулок). 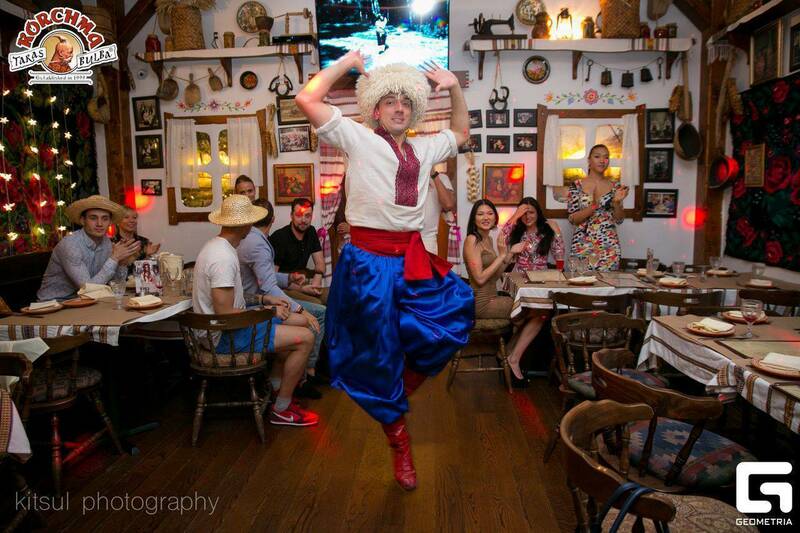 This restaurant was established by travellers who gather recipes during their expeditions and are thus able to acquaint Muscovites with the traditional dishes of different peoples inhabiting Russia. Here you can try stroganinaa dish of the indigenous people of northern Arctic Siberia consisting of raw, thin, long-sliced frozen fish, or Russian sushi, rare gourmet fish (omul, sockeye), and much more. The menu offers a wide variety of hot deer and fowl dishes, soups, desserts and sauces made with berries from the North of Russia. 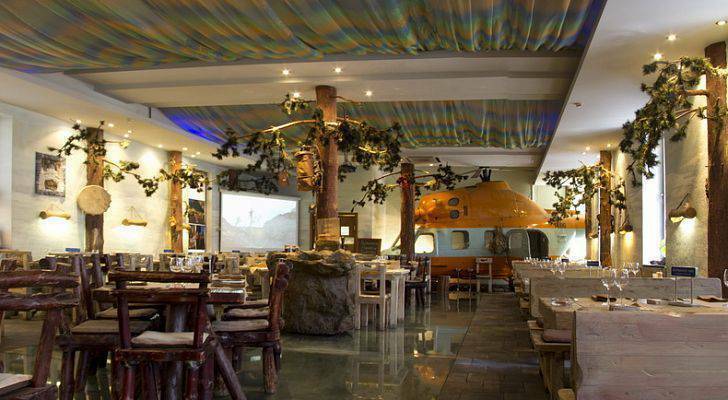 The restaurant’s interior features crudely built furniture, animal skins and pines growing towards the ceiling. In the corner of the main hall is an authentic MI-2 helicopter. The restaurant has a special kids’ menu and holds classes for kids on weekends. 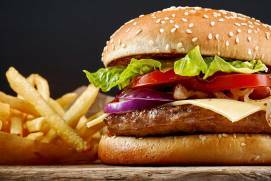 Chain restaurants are the most numerous in this category, and the average bill is 300 to 1000 RUB. The most popular are Mu-muRussian: Му-му and Yolki-PalkiRussian: Ёлки-Палки. 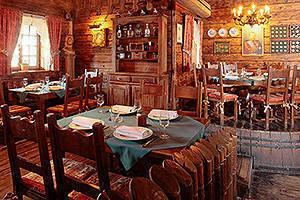 These restaurants have rural style interiors, and their menus offer everyday Russian food, the type served regularly in any modern Russian family. 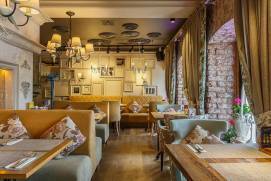 With its 38 free-flow self-service cafés, Mu-mu is the most extensive café network in Moscow. Yolki-Palki offers table service and has 11 cafés. 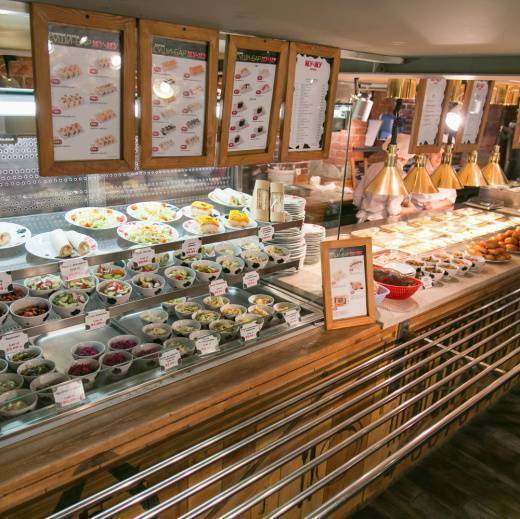 It has an open buffet called TelegaRussian: Телега, where visitors can treat themselves to an all-you-can-eat buffet lunch at a reasonable price. The self-service GrabliRussian: Грабли café chain (10 locations) features landscape design, with artificial flowers, trees, benches and so on. The Kroshka-kartoshkaRussian: Крошка-картошка fast food restaurants are available throughout the city (some 200 locations). They are mostly located near metro stations and in the food courts inside shopping malls. The average bill is about 200 RUB, making Kroshka-kartoshka the cheapest of all Russian restaurants in Moscow. The company’s specialty is foiled whole potatoes with fillings (cheese, fresh herbs, pickled mushrooms and salads). Blini, or traditional Russian pancakes, is the specialty of another public catering facility, TeremokRussian: Теремок (280 locations). The owners label their restaurants as “fast casual” instead of blatantly “fast food”. Many cafés are located in the vicinity of popular tourist destinations (ArbatRussian: Арбат, Cathedral of Christ the SaviourRussian: Khram Khrista Spasitelya or Храм Христа Спасителя, Maroseyka StreetRussian: ulitsa Maroseyka or улица Маросейка, etc.). The menu offers blinis, soups, salads, porridges, pelmenis, cottage cheese pancakes, fruit drinks, kvas and original specialties such as blinburger. Average bill: 400 RUB.